The food was so bad that we couldn't even eat it, and ended up getting our meal for free. FIRST TIME EVER! They were out of everything. The waitress informed us that the chef had a feeling that we'd be sending our food back as it wasn't "up to par" to begin with. The restaurant decor was OK, but nothing special. The wait staff was clueless. Mom and I had to stop for a pack of gum on the way home to get the horrible taste of the bad food out of our mouths. Just thinking about that meal gives us nightmares. It was that bad. We gave it a "never again" score and vowed never to return. However, on the advice of our fans, we decided to be brave and revisit the restaurant as we had heard that there had been many updates. Mom and I reluctantly pulled into the large parking lot at just past 4 p.m. The first thing that we noticed was how modern and clean everything looked. 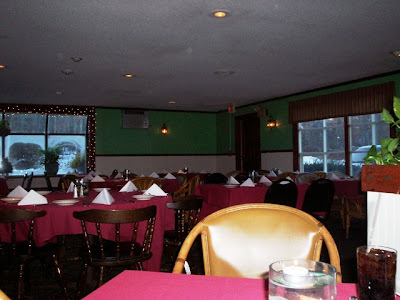 The old decor wasn't bad, but it looked like it hadn't been updated in years. We were quickly greeted by a friendly host who showed us to a cozy table and provided us with two menus and two lists of specials. He also lit a tea light candle and placed it into the water-filled centerpiece on our table – very classy. As Mom and I looked over the menu, our waitress – who we later learned was named Marge – came over and took our drink order. We chose two Diet Cokes, which quickly arrived in real glasses ($2 each). There were so many choices on the menu and specials’ list that Mom and I needed a few extra minutes to decide what we wanted. When Marge returned, we were finally ready to order. Mom ordered the chicken parmesan ($12.95), and I chose the gourmet plate ($14.95), which was on the specials’ list. The description was so intriguing that I just had to try it. 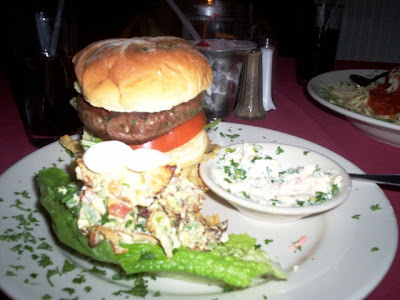 It was a filet mignon burger with a side of bacon and blue cheese potato salad and chipotle cole slaw. The meal even came with a vanilla raspberry milkshake! How could I have turned that down? Marge informed us that both of our meals came with a soup/salad option. We both chose salads, which arrived quickly with our chosen dressings (Mom chose French; I chose a wine vinaigrette). We were also asked if we would like some bread with our meal, which we did. Marge brought over a fresh loaf of French bread complete with butter and infused dipping oil. Both starters were a fresh and delicious intro for what was about to come. We hadn’t been waiting long before we saw Marge coming over with our meals. When she placed them down in front of us, both Mom and I were amazed at how beautiful the presentations were. I can honestly say that I have never had a meal that looked anything like the gourmet plate. I was just hoping that it tasted as good as it looked – and it did. The filet mignon burger was like nothing I have ever had before. Sitting on a bed of onion straws, I almost hated to dig in because everything looked so picturesque. The texture of the meat was almost like a pâté because it was so finely ground. It was cooked to perfection (I ordered it medium well) and was accompanied on the freshly grilled bun by a tomato and some greens. The bacon and blue cheese potato salad was served inside a lettuce leaf and was just as tasty as it sounds. The chipotle cole slaw was cool and creamy, and the vanilla raspberry milkshake topped with a cherry was a refreshing way to end a fantastic meal. This meal was a flavor explosion. I really hope they add this to the menu. For only $14.95, you get a plate filled with gourmet delicacies. It is a MUST HAVE. Mom’s chicken parmesan was also beautifully presented. It had two “antlers” – which was actually fried pasta – sticking out of the tender chicken piece. The chicken breast was very large and cooked to perfection. The outside had a nice crispy crust, and the inside was perfectly white, moist, and delicious. It rested upon a mound of what Mom thinks was cappellini and covered in a delicious homemade sauce. The sauce tasted fresh, and was not watery or overly spiced. 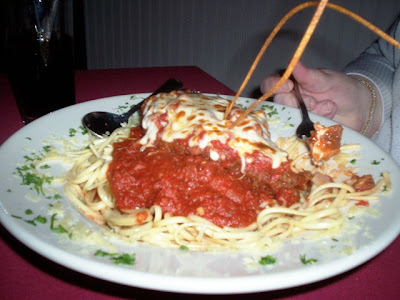 Mom said that this meal ranks right up there with one of the best chicken parmesans that she has ever had. To top it off, the serving she received was more than generous. At one point during the meal, the chef came over to ask us if we were enjoying our dinner. Always a picture of class, we both muttered an “excellent” and a “very good” as we continued to cram food into our already full mouths. He seemed pleased that we were enjoying his food so much. How could we not? It was outstanding. We left $42 on the table for Marge, which included a 20% tip. She was an excellent waitress. As we shuffled our full bodies back out into the cold, we commented on how much we’d hated our last visit, and how this experience was like walking in to a completely different restaurant. What a turnaround! Crowther’s Restaurant is officially the highest climber we’ve ever had. It has gone from a “never again” to an “excellent” because this meal was truly one of the best we’ve ever had. 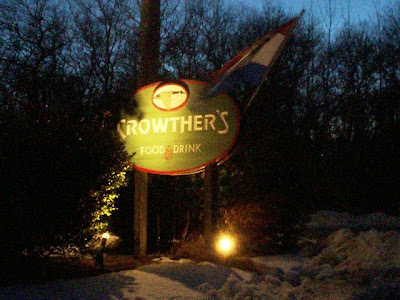 We can’t wait to visit Crowther’s again. I can’t even believe I just typed that sentence, considering what our first review was like. I’ll say it again – what a difference a renovation makes. From the restroom to the fun jazz background music, this place is A+ in our book. 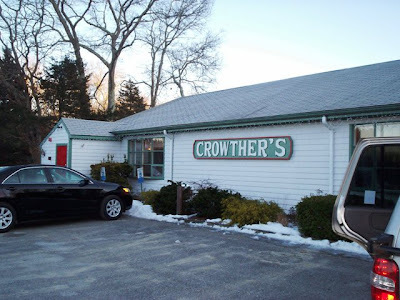 If you’re one of those people who have visited Crowther’s in the past and had a bad experience, do yourself a favor and revisit. I’m sure that you will not be disappointed. 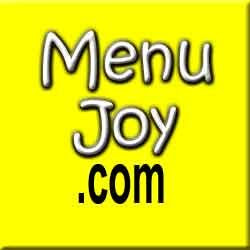 For more information, please visit their Web site at www.crowthersrestaurant.com.